Allegro MicroSystems: The ACS722 and ACS723 Hall-effect current sensor ICs from Allegro MicroSystems Europe are now available in a high-isolation SOIC16 package. The low-profile surface-mount package is ideal for space constrained applications while also saving costs due to reduced board area, yet provides a 4800 V RMS isolation rating: the highest available from Allegro’s family of surface-mount current sensor ICs. The new high-accuracy devices provide economical and precise solutions for AC or DC current sensing in industrial and commercial applications. 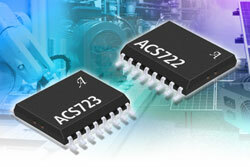 In addition to their small size and high accuracy, the ACS722 and ACS723 offer the additional benefits of superior isolation performance, low power consumption, and a wide operating temperature range with near zero magnetic hysteresis. Each device consists of a precise, low-offset, linear Hall sensor circuit with a copper conduction path located near the surface of the die. Applied current flowing through this copper conduction path generates a magnetic field which is sensed by the integrated Hall IC and converted into a proportional voltage. Device accuracy is optimised through the close proximity of the magnetic field to the Hall transducer. A precise, proportional voltage is provided by the low-offset, chopper-stabilised BiCMOS Hall IC, which includes Allegro’s patented digital temperature compensation technique, resulting in extremely accurate performance over temperature. The output of the device has a positive slope when an increasing current passes through the primary copper conduction path, which is the path used for current sensing. The internal resistance of this conductive path is typically 0.85 milliohms, providing low power loss. The terminals of the conductive path are electrically isolated from the sensor leads, allowing the current sensor ICs to be used in high-side current sense applications without the use of high-side differential amplifiers or other costly isolation techniques. Typical applications include motor control, solar inverters, home automation and monitoring as well as those applications requiring reinforced isolation ranges. They are not designed for use in automotive applications. Both devices are provided in a low-profile surface-mount SOIC16 package. The leadframe is plated with 100% matt tin, which is compatible with standard lead (Pb) free printed circuit board assembly processes. Internally, the device is Pb-free, except for flip-chip high-temperature Pb-based solder balls, currently exempt from RoHS. The devices are fully calibrated prior to shipment from the factory.